I recently tried these new long boots from Kocostar and you may have seen my adventures on IG stories. A slightly shorter version of this review is also posted on my Instagram. These Kocostar Long Boots were provided to me by the K-beauty Expo for review purposes as part of my role as 2017 Beauty Editor. Unfortunately I found them too small for me so I would not purchase them myself. I love the packaging. The yellow and black is very eye catching and is fitting for the old Hollywood look. The product comes in a cardboard sleeve and then the normal foil packet. From an Eco standpoint I don’t really seem the necessity for the cardboard. I think it perhaps makes it seem more luxurious but I would rather save the trees. 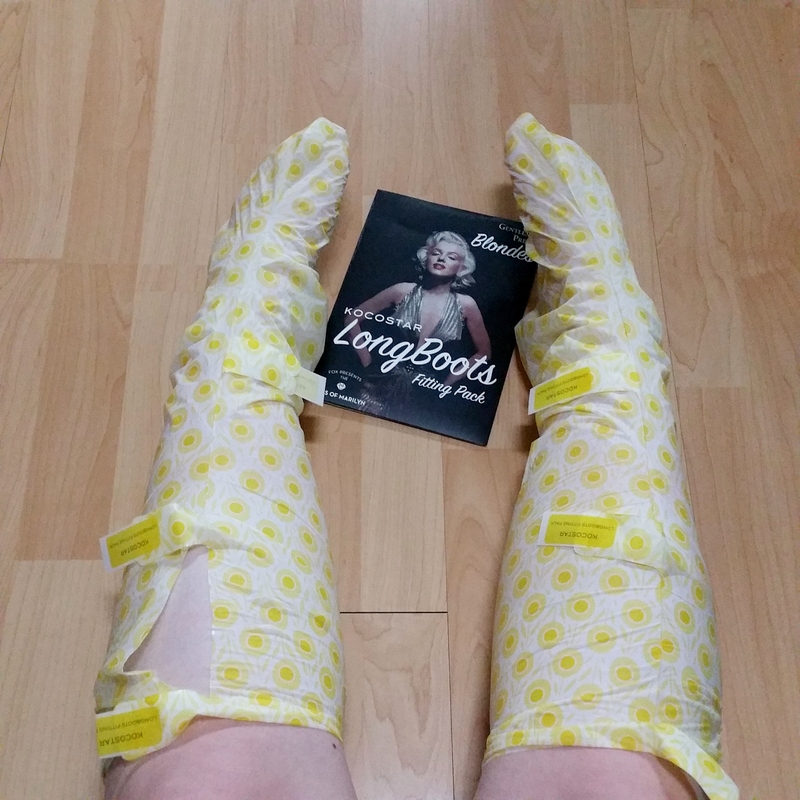 The long boots are designed to relieve your feet and legs after long days on your feet. They have menthol included in the ingredients which gives it a cool feeling on the skin. Other ingredients include damask rose for soothing and argan and camellia oil for moisturizing. They also have keratin and fruit extracts and other ingredients for soft and smooth skin. The boots are made of a special waterproof fabric like many of Kocostar’s other feet and hand products. This ensures that the essence stays inside and does not leak out. It also means that you can move around while wearing them and you won’t make a mess. I wouldn’t recommend moving about too much as although it does not make a mess it is still slippery. The long boots have three sticky tabs down the front. One at the ankle, calf and knee. These are used to secure the boot around your leg so it does not slip down. My legs are large and so I did not need these at all. But I have used these on the ankle boots and the hand gloves to secure them on and they work fine so I imagine they would work fine here too. First clean your feet and legs. Then take the boot and open the top. There is a perforated strip at the top that you can pull or cut to open the boot. Slide the boots up over your feet and pull up like a sock. Use the three sticker tabs to secure it around your leg and ensure that they don’t fall down or move around too much. Leave them on for 15 to 20 minutes. You can lightly massage your feet and calves for more effect. You don’t need to rinse the essence off afterwards. I was dubious about the fit of these from the start. I have very large calves (45 centimeters around) and have never been able to wear long boots. When I took them out they looked quite big so I was hopeful for a bit until I tried them. They were much to tight for me to fully pull up. I even ripped one trying to get it up. The second one went on better but it was really tight still and slightly uncomfortable. I know these are made for the Korean market so they probably fit the majority of people they are designed for however I feel like they should have two sizes. Ideally respectfully named but I may be asking for a bit much as unfortunately we don’t live in a perfect world. This product smells very strongly of menthol as soon as you opened the foil package. I like that smell so I had no problems with that but it’s something to be aware of in case you don’t care for the scent. The essence felt nice and cooling on my skin and once I removed the boots I just massaged the essence into my skin. There was quite a lot of it but once you rub it in it soon absorbs into the skin. It left my skin feeling nice and smooth and moisturized. Overall I did like like the idea of these and the essence so it was a shame about the sizing. These retail for 8,000 won on the Kocostar website. 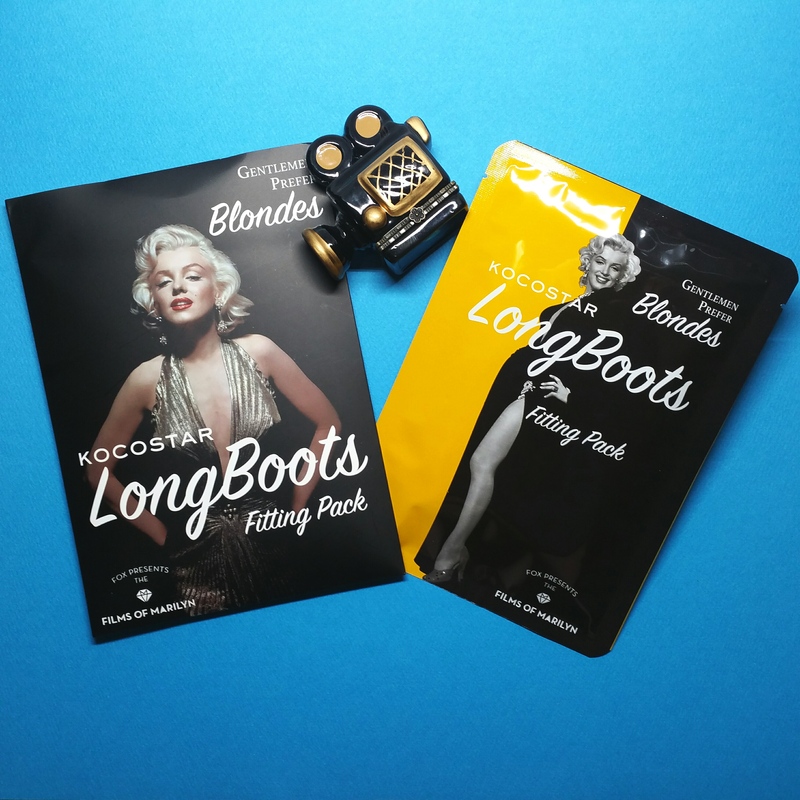 Posted on July 15, 2017 by cuteprettybeautyPosted in Feet, K-Beauty Expo, Kbeauty, Kocostar, Korean Skincare and Beauty, Mask, SkincareTagged Beauty Mask, Feet, Foot Mask, Kbeauty, Kocostar, Korean Beauty, Long Boots, Long Boots Fitting Pack, Mask. It doesn’t even look like the foot part would fit me, let alone the calves. That’s too bad. At least you still got them on to try them out!! Ah yeah I didn’t even think about foot size. I have reasonably small feet so its never been an issue for me but Korea does not really cater to bigger sizes. My has larger feet and always has trouble finding shoes. I should have measured the foot part.